Porcelain veneers are ultra thin shells made of tooth coloured materials designed to correct any of the problems mentioned above. They are bonded to the front surfaces of the teeth to improve their appearance as well as your smile. If you want to enhance your smile with porcelain veneers, the first step is to visit us for a consultation with our experienced cosmetic dentist who will assess your existing dental condition, discuss your concerns and the desired results including the cost involved. Upon your agreement, the next visit will be made during which time the cosmetic dentist will perform a mock up of your teeth for your approval before preparing the teeth. A model will then be made, which is sent to the dental lab for the fabrication of the veneers. This process usually requires 1 to 2 weeks. Once your veneers are finished, you will be required to visit the clinic for your third appointment. This time, your veneers are ready to be bonded to your teeth. The result is a fully transformed, stunning smile. 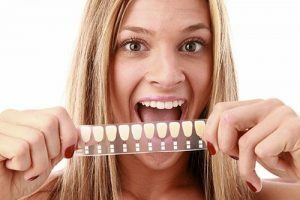 If you want to have a new smile or correct the flaws in your teeth, porcelain veneers may be the right treatment for you. Cardiff Dental provides high-quality porcelain veneers that look natural on your teeth. We will first perform a thorough examination to see if you are a good candidate for this treatment. If you require porcelain veneers to correct your smile, schedule an appointment with us today for a consultation. Contact us on (02) 4954 6888 today!